Erika Nelson, creator of the World’s Largest Collection of the World’s Smallest Versions of the World’s Largest Things, travels the United States looking for “monsters of the road” (things like the world’s largest ketchup bottle or ball of yarn). She then photographs them and makes a World’s Smallest Version of said World’s Largest Thing. This artsy public restroom is shaped like a giant john. Once Nelson researches, visits, and photographs a World’s Largest Thing, she then makes a miniature replica of the “thing.” When possible, Nelson will bring the tiny version back to the enormous structure that inspired it and snap a photo of the two items together. The little replicas and photographs are then displayed in the museum and online. Nelson makes the World’s Smallest Versions of The World’s Largest Things from a medley of materials. For example, when replicating the world’s largest ball of rubber bands, she used the miniature rubber bands you’d find at an orthodontist’s office. Nelson is an artist, educator, and one of America’s foremost experts and speakers on the World’s Largest Things. In addition to visiting communities with her own unique traveling museum, which acquired a permanent base in 2017, Nelson is a consultant to cities seeking to create their own “World’s Largest Thing” or roadside attraction to increase tourism, marketing, and economic development for their community. 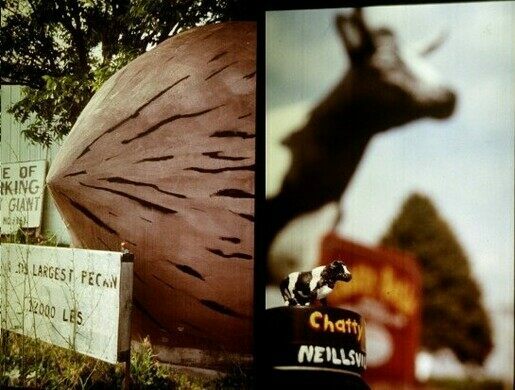 When not on the road, Nelson and the “World’s Largest Collection of The World’s Smallest Versions of The World’s Largest Things” van can be found in Lucas, Kansas. 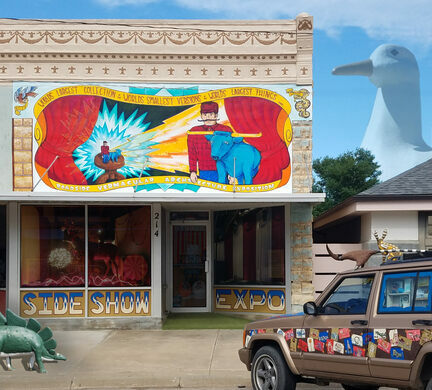 In 2017, The World's Largest Collection of Smallest Versions of Largest Things acquired a downtown building in Lucas, Kansas. 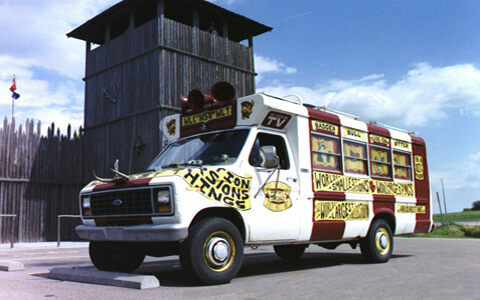 The new building has allowed the collection to transition from traveling displays and sideshow banners to a new Roadside Sideshow Expo. Visitors keen on visiting the collection can find it at 214 South Main in Lucas. The museum is open by chance or by appointment.